Don’t let your budget cause you to settle for boring bedroom furniture! Amazing sales on bedroom groups are happening now at Badcock Home Furniture &more! Whether you are looking for king sets, queen sets, full sets, twin sets, youth sets, or bunk beds – we’ve got you covered. Stop by any of our convenient locations to shop our current bedroom sale or browse online. We offer charming options for dressers, night stands, and other essential bedroom furniture as well. Turn your bedroom into a restful retreat, and get a great night’s sleep knowing you saved big on your gorgeous new bedroom set! Found something you absolutely love? 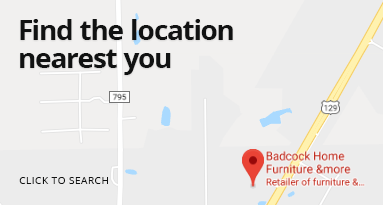 Badcock offers affordable in-house financing – even on sale items! This beautifully scrolled and detailed collection is a nod to traditional old world ornate design and adds rich depth to any décor. The grand scale of all the pieces is sure to make you feel like royalty, even from the comfort of your own home. This group includes complete King sleigh bed, dresser and mirror. Other pieces sold separately. This beautifully scrolled and detailed collection is a nod to traditional old world ornate design and adds rich depth to any décor. The grand scale of all the pieces is sure to make you feel like royalty, even from the comfort of your own home. This group includes complete Queen sleigh bed, dresser and mirror. Other pieces sold separately. This charming children's collection is constructed of Rubber Wood with Birch and Acacia veneers and finished in a gorgeous rich chocolate. The quaint no-hardware dresser is easy to open and features kenlin metal drawer glides, felt lined top drawers and dust proof bottom drawers. Soft corners on all the pieces in this collection combine with the streamlined and elegant design of the bed to make for safe, bump free bedtime! This group includes the full bed, dresser & mirror. This charming children's collection is constructed of Rubber Wood with Birch and Acacia veneers and finished in a gorgeous rich chocolate. The quaint no-hardware dresser is easy to open and features kenlin metal drawer glides, felt lined top drawers and dust proof bottom drawers. Soft corners on all the pieces in this collection combine with the streamlined and elegant design of the bed to make for safe, bump free bedtime! This group includes the twin bed, dresser & mirror. Stunning, sophisticated and versatile, our Diplomat Collection fits right into to any design scheme. With sleek features, like rich, retro-looking finishes on the solid wood drawer pulls, it’s perfect for bringing a bold, distinguished look to your bedroom. Generous storage features only multiply your convenience when you add the chest and nightstand. This group includes the King panel bed, dresser and mirror. Stunning, sophisticated and versatile, our Diplomat Collection fits right into to any design scheme. With sleek features, like rich, retro-looking finishes on the solid wood drawer pulls, it’s perfect for bringing a bold, distinguished look to your bedroom. Generous storage features only multiply your convenience when you add the dresser and nightstand. This group includes the King storage bed, dresser and mirror. Stunning, sophisticated and versatile, our Diplomat Collection fits right into to any design scheme. With sleek features, like rich, retro-looking finishes on the solid wood drawer pulls, it’s perfect for bringing a bold, distinguished look to your bedroom. Generous storage features only multiply your convenience when you add the chest and nightstand. This group includes the Queen panel bed, dresser and mirror. Stunning, sophisticated and versatile, our Diplomat Collection fits right into to any design scheme. With sleek features, like rich, retro-looking finishes on the solid wood drawer pulls, it’s perfect for bringing a bold, distinguished look to your bedroom. Generous storage features only multiply your convenience when you add the dresser and nightstand. This group includes the Queen storage bed, dresser and mirror. Retreat to your new bedroom with the sophisticated style of the Enzo Collection from Elements. Made with pine solids and cherry veneers, the espresso finish is rich and luxurious while the silver hardware adds a polished touch of class. Slightly sloped angled feet complete the look. Because you can never have “too much” storage, the Enzo bed is equipped with two drawers at the foot of the bed for extra space. The gracefully arched headboard has a padded leather section for added comfort. The six-drawer dresser boasts a beautiful espresso finish and silver hardware. The matching mirror has an arched top to echo the style of the bed. This group includes complete King storage bed, dresser and mirror. Other pieces sold separately. Retreat to your new bedroom with the sophisticated style of the Enzo Collection from Elements. Made with pine solids and cherry veneers, the espresso finish is rich and luxurious while the silver hardware adds a polished touch of class. Slightly sloped angled feet complete the look. Because you can never have “too much” storage, the Enzo bed is equipped with two drawers at the foot of the bed for extra space. The gracefully arched headboard has a padded leather section for added comfort. The six-drawer dresser boasts a beautiful espresso finish and silver hardware. The matching mirror has an arched top to echo the style of the bed. This group includes complete Queen storage bed, dresser and mirror. Other pieces sold separately. Give yourself the gift of an impressive bedroom when you purchase the Landon Collection matched up with the beautiful Flax II upholstered bed. Made from strong Asian hardwood and poplar with an elegant agathis veneer and antique bronze hardware, this collection combines modern charm with classic appeal and boosts the style of any home. This group comes with the King beige upholstered bed, dresser and mirror. Give yourself the gift of an impressive bedroom when you purchase the Landon Collection matched up with the beautiful Flax II upholstered bed. Made from strong Asian hardwood and poplar with an elegant agathis veneer and antique bronze hardware, this collection combines modern charm with classic appeal and boosts the style of any home. This group comes with the Queen beige upholstered bed, dresser and mirror. Spend your nights in splendid bliss with this upscale bed. Covered in beige fabric with antique brass nail-head accents, this model is a beautiful combination of traditional and modern styles. For stability and longevity, it has four slats with center-support legs and a headboard that adjusts from 56” to 59” to accommodate different bedding preferences. Sleep in upscale bliss and grab the Flax II king bed today. You deserve to love where you lay down. This queen bed is clad in beige fabric with wonderful trim of antique brass nail heads. For peak stability, it has four slats with center-support legs and a headboard that adjusts from 56” to 59” to accommodate different bedding preferences. Bring sophisticated comfort into your bedroom today. Your bedroom deserves the ultimate style centerpiece. Clad in a beige fabric, this stately bed has beautiful antique brass nail-head accents, four slats with center-support legs and a headboard that adjusts from 56” to 59” to accommodate different bedding preferences. Bring your bedroom style to the next level. The Grace Youth Bedroom Collection is charming and inviting and brings lovely Victorian cottage ambiance to every young lady’s bedroom space. Pleasing design features include delicate string-of-pearls beaded trim, floral motif overlay ornaments, and graceful S-curve crowns with shell carvings, plus the repeated use of oval shapes. Notice the ogee-shaped undertop moldings with their secret felt-lined drawers, and the gently curving base rail cut-outs. The Grace Collection is constructed of solid pine and quality wood products with a clean white paint finish, accented by scrolled hardware in a brushed nickel color. This group includes full bed, dresser & mirror. The Grace Youth Bedroom Collection is charming and inviting and brings lovely Victorian cottage ambiance to every young lady’s bedroom space. Pleasing design features include delicate string-of-pearls beaded trim, floral motif overlay ornaments, and graceful S-curve crowns with shell carvings, plus the repeated use of oval shapes. Notice the ogee-shaped undertop moldings with their secret felt-lined drawers, and the gently curving base rail cut-outs. The Grace Collection is constructed of solid pine and quality wood products with a clean white paint finish, accented by scrolled hardware in a brushed nickel color. This group includes twin bed, dresser & mirror. The charming and delightful details of this collection lend a lovely Victorian cottage ambiance to every young lady’s bedroom space. It is constructed of solid pine and quality wood products with a clean silver paint finish, accented by many ornamental details, including scrolled hardware in a brushed-nickel color with clear faceted knobs. This group includes full bed (headboard, footboard & rails), dresser and mirror. The charming and delightful details of this collection lend a lovely Victorian cottage ambiance to every young lady’s bedroom space. It is constructed of solid pine and quality wood products with a clean silver paint finish, accented by many ornamental details, including scrolled hardware in a brushed-nickel color with clear faceted knobs. This group includes twin bed (headboard, footboard & rails), dresser and mirror. You’ll love the versatile contemporary-rustic style of our Homestead Collection. Available in your choice of fabric or a wood slatted frame, the hand-applied, distressed grey wood finish and gunmetal-grey pulls brings modern charm to this piece. Best of all, there is more than just beauty behind this design. It’s also extremely functional with a nine-drawer dresser and optional five-drawer chest that can handle even the largest of wardrobes. Add the nightstand to complete the collection and enjoy the comfort and style of a modern cabin retreat, all year round. This 5 PC group includes the King slat bed, dresser and mirror. You’ll love the versatile contemporary-rustic style of our Homestead Collection. Available in your choice of fabric or a wood slatted frame, the hand-applied, distressed grey wood finish and gunmetal-grey pulls brings modern charm to this piece. Best of all, there is more than just beauty behind this design. It’s also extremely functional with a nine-drawer dresser and optional five-drawer chest that can handle even the largest of wardrobes. Add the nightstand to complete the collection and enjoy the comfort and style of a modern cabin retreat, all year round. This 5 PC group includes the King upholstered bed, dresser and mirror. You’ll love the versatile contemporary-rustic style of our Homestead Collection. Available in your choice of fabric or a wood slatted frame, the hand-applied, distressed grey wood finish and gunmetal-grey pulls brings modern charm to this piece. Best of all, there is more than just beauty behind this design. It’s also extremely functional with a nine-drawer dresser and optional five-drawer chest that can handle even the largest of wardrobes. Add the nightstand to complete the collection and enjoy the comfort and style of a modern cabin retreat, all year round. This 5 PC group includes the Queen slat bed, dresser and mirror. You’ll love the versatile contemporary-rustic style of our Homestead Collection. Available in your choice of fabric or a wood slatted frame, the hand-applied, distressed grey wood finish and gunmetal-grey pulls brings modern charm to this piece. Best of all, there is more than just beauty behind this design. It’s also extremely functional with a nine-drawer dresser and optional five-drawer chest that can handle even the largest of wardrobes. Add the nightstand to complete the collection and enjoy the comfort and style of a modern cabin retreat, all year round. This 5 PC group includes the Queen upholstered bed, dresser and mirror.